"The Great Manure Hill Experiment Our Gumpkin"
I shared with you about one of our planting experiments. 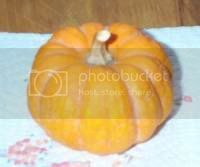 I have always enjoyed miniature pumpkins and gourds. for a inexpensive Fall decoration. on the pumpkin with a black magic marker. used for dinner table centerpeices. Too C U T E !!!!! Another decorating idea is a Miniature Pumpkin Wreath. It's made by using a wire form, mini-pumpkins, spanish moss and a bow. Next Fall I will share more detailed instructions. mini pumpkins for serving wild rice or other vegetarian sides. to use my pumpkins for food. This Fall I intend on trying them for myself. or as a side with any kind of entree you desire. and fill with enough water to cover. While rice is cooking, cut the top off the pumpkins. Scoop out the seeds and strings with a spoon. 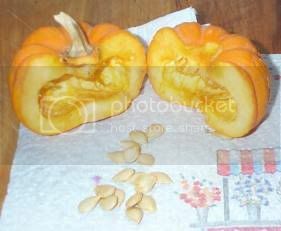 Place the pumpkins upside down in a baking pan with 1/3 inch of water. approximately 5 to 10 additional minutes. Place the cooked , rinsed and cooled rice in medium size bowl. Juice the orange and add honey, mixing together well. Pour honey mixture over the rice. Add salt and black pepper, and stir well. Stir in the cranberries, pecans, orange zest. Spoon the rice into each of the pumpkins and serve. on the box, maybe add some nuts.